Other common names: Indian tobacco, wild tobacco, asthma weed, gagroot, vomit-wort, puke weed, emetic herb, bladder pod, low belia, eyebright. Habitat and range: Lobelia may be found in sunny situations in open woodlands, old fields and pastures, and along roadsides nearly everywhere in the United States, but especially east of the Mississippi River. Description: This poisonous plant, an annual belonging to the bellflower family (Campanulaceae), contains an acrid, milky juice. Its simple stem has but few short branches and is smooth above, while the lower part is rough hairy. The leaves are placed alternately along the stem, those on the upper portion small and stemless and the lower leaves larger and borne on stalks. They are pale green and thin in texture, from 1 to about 2 inches in length, oblong or oval, blunt at the apex, the margins irregularly saw toothed, and both upper and lower surfaces furnished with short hairs. Lobelia may be found in flower from summer until frost, but its pale-blue flowers, while very numerous, are very small and inconspicuous. They are borne on very short stems in the axils of the upper leaves. The lower lip of each flower has three lobes and the upper one two segments, from the center of which the tube is cleft to the base. The inflated capsules are nearly round, marked with parallel grooves, and contain very numerous extremely minute dark-brown seeds. Collection, prices, and uses: The Pharmacopoeia directs that the leaves and tops be collected after some of the capsules have become inflated. Not too much of the stemmy portion should be included. The leaves and tops should be dried in the shade and when dry kept in covered receptacles. The price paid for the dried leaves and tops is about 3 cents a pound. 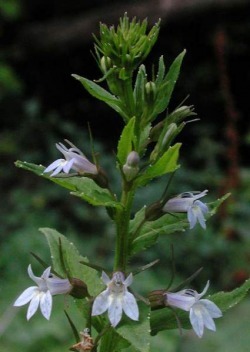 Lobelia has expectorant properties, acts upon the nervous system and bowels, causes vomiting, and is poisonous. The seed of lobelia is also employed in medicine.